Peter is well aware that there is a new baby in the house. His mother shushes him when his tower of blocks falls and makes too much noise. He’s also well aware that the new baby’s a girl, for everything that used to be Peter’s has been painted pink! His old cradle is pink, his old crib is pink, and he discovers his father is in the middle of covering his old blue high chair in pink paint. 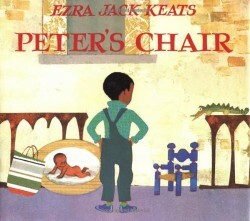 Finally, he discovers his old chair that has not yet been touched: “They didn’t paint that yet!” Peter shouts. Swiftly, he carries it to his room and makes plans with his dog, Willie, to run away with the chair. Once outside, he tries sitting in his old chair for the first time in a long while. He’s too big!